Facebook&apos;s evil button!? uh what? 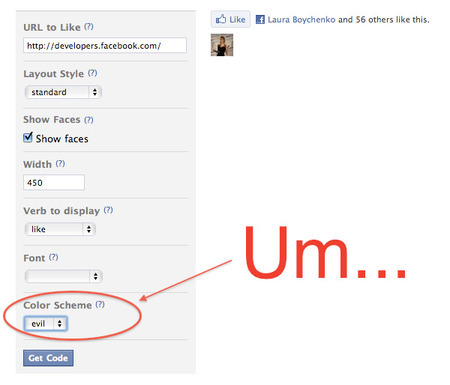 Funny little revelation today on the developer site for the new Facebook Like button. Turns out there are 3 options for the display of the Like button: dark, light and uh “evil”. Since when has that been a design option? What is Facebook trying to tell us about this Like button of theirs? Apparently if you choose it, it looks just the same as light. Techcruch spotted it earlier this evening. Screengrab below. Just checked Facebook developer but it’s now gone unfortunately. Yaa This Evil Button is For Choose Color in Like Button Which Use For Place Fanpage Like Button In Our Website.